Disney’s Caribbean Beach Resort is a popular island inspired moderate resort at Disney World. The popularity of this resort will grow even more once the Disney Skyliner transportation system becomes operational. 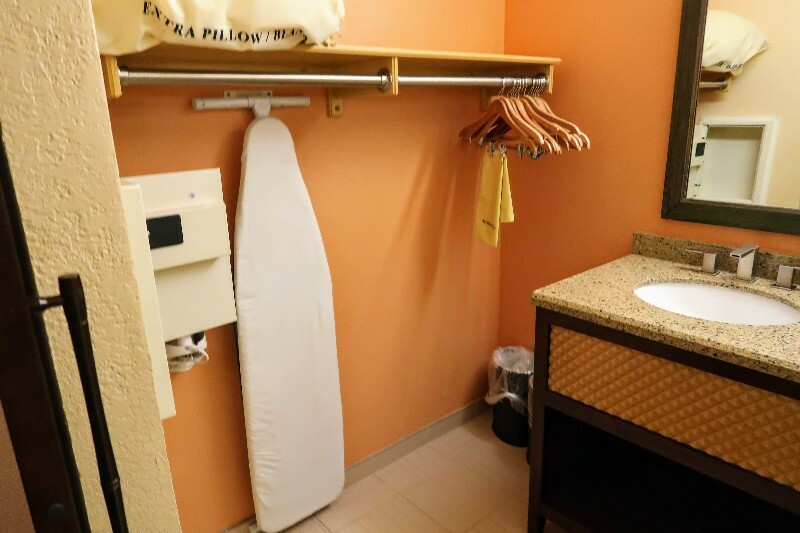 Take a virtual tour of our Disney’s Caribbean Beach Resort standard view room and this relaxed island oasis resort at Disney World. Disney’s Caribbean Beach Club is considered an Epcot area resort. The Caribbean Beach Resort lobby is large and airy with high ceilings and colorful accents. There are several comfortable seating areas and even high top tables with electrical outlets in the lobby. Outside the resort is surrounded by lush palm trees and beautiful views of Barefoot Bay. There are a handful of beach areas with hammocks perfect for relaxing along the shores of Barefoot Bay. Or you can grab a seat and watch Epcot fireworks in the distance from outside Port Royale near the pool area. Winding walkways interconnect Old Port Royale with the 5 sections of the hotel. Each section of hotel rooms is named for a tropical island: Aruba, Jamaica, Barbados, Martinique, and Trinidad. Old Port Royale is the hub of activity at Disney’s Caribbean Beach Resort. Inside Old Port Royale is the check-in desk, main lobby, gift shop, and a quick service restaurant. The entrance to Sebastian’s Bistro is located around the back of Old Port Royale. 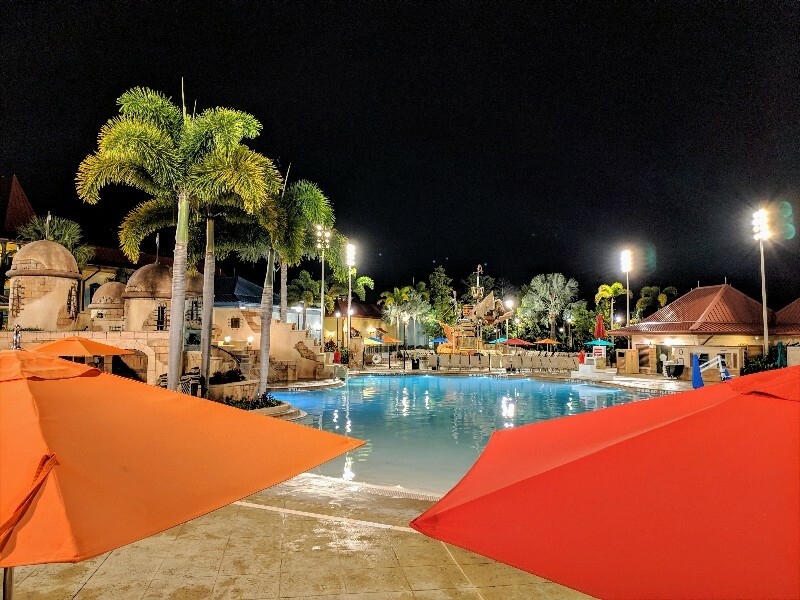 The main pool at Caribbean Beach Resort is Fuentes del Morro Pool, This large pool has two water slides and an adjacent ship-inspired water play area for kids under 48 inches tall. There is also a small leisure pool for each of the five island sections. This way you can take a quick dip in the pool without having to walk to Fuentes del Morro. On our first night we had dinner at Sebastian’s Bistro. Sebastian’s Bistro serves Caribbean and Latin inspired foods in a bright and welcoming atmosphere. 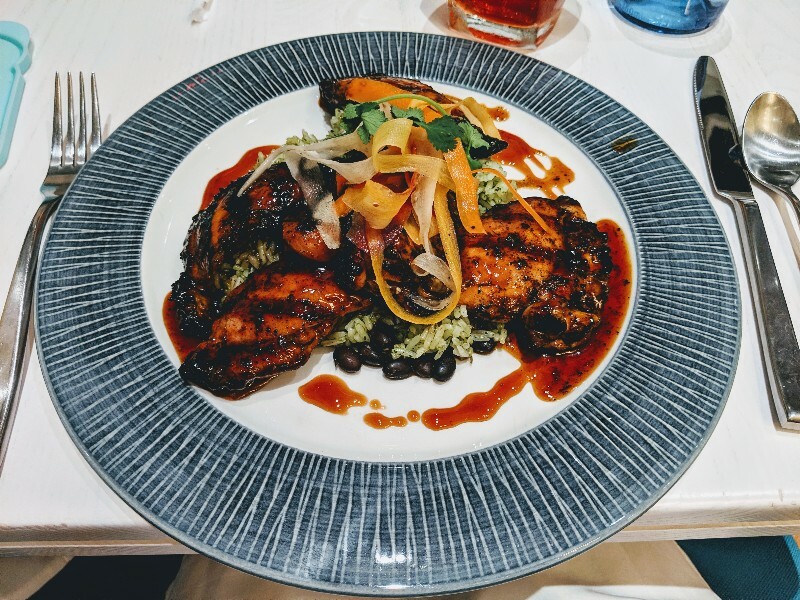 The jerk chicken, sustainable fish, and slow cooked pork shoulder entrees were all flavorful. We enjoyed our meal at Sebastian’s Bistro and would go back again. Check out this article for other delicious Disney World restaurant recommendations or here for character meal options. Caribbean Beach Resort’s other dining options are Banana Cabana, Spyglass Grill, and Centertown Market. Banana Cabana is a pool lounge next to Fuentes del Morro that serves drinks and a limited food menu. Spyglass Grill is a quick service spot with a interesting menu near the Trinidad pool area serving breakfast, lunch, and dinner. The main quick service dining at Caribbean Beach Resort is the large Centertown Market. Centertown Market has diverse food options and a large seating area just off the main lobby at Old Port Royale. Our Caribbean Beach Resort standard view room was in the Aruba section of the resort and only a few minutes walk to Old Port Royale. However, since we arrived late at night (and this was our first stay at the sprawling Caribbean Beach Resort) I asked for bell services to drive us to our room. This saved us the hassle of trying to find our room in the dark while toting all of our luggage. At check-out we knew the resort better and easily walked to the lobby with our luggage. The standard view rooms at Caribbean Beach Resort can have views of the resort hotel, courtyard or woodlands. Our standard view room had two queen sized beds, but there are some Caribbean Beach Resort standard rooms that have an optional 5th sleeper. This 5th sleeper room has a child-sized pull down bed that our room did not. 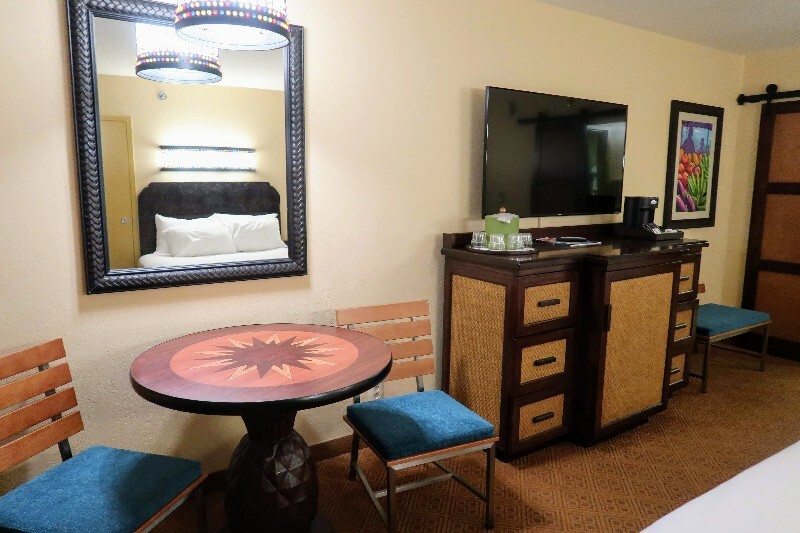 However, other than that the Caribbean Beach Resort rooms are nearly identical. When you enter the room there are two queen beds, a large dresser, and a table with two chairs. Carved, dark wood headboards are a stark contrast to the crisp white linens on the two queen sized beds. The sconces over the beds bring a pop of primary color and additional detail to the bed area. A matching chandelier is over the table and chairs. We love having a table with chairs so we can take turns eating breakfast in the morning. The large rattan accented dresser has many functions. The top holds a coffee maker, ice bucket and glasses. There are also several built-in electrical outlets and USB-C plugs on top of the dresser. There are a few drawers to hold clothing or other items and the mini fridge is hidden behind the middle panel. 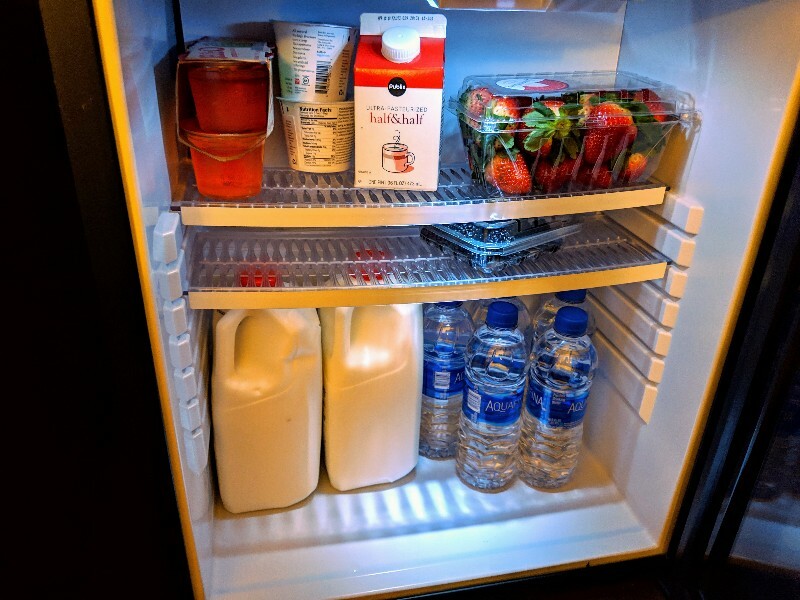 We packed our mini-fridge with 2 half-gallons of milk (a full gallon would have been too big), 6 bottles of water, some yogurt, Jello cups, a pint of half and half, strawberries, and blackberries. I was happy with the mini-fridge capacity. The bedroom area is closed off from the bathroom by two sliding barn doors. These doors did a good job of dampening light and some sound from reaching the bedroom area. This made it easier for our daughter to sleep while we got ready in the morning or evening. 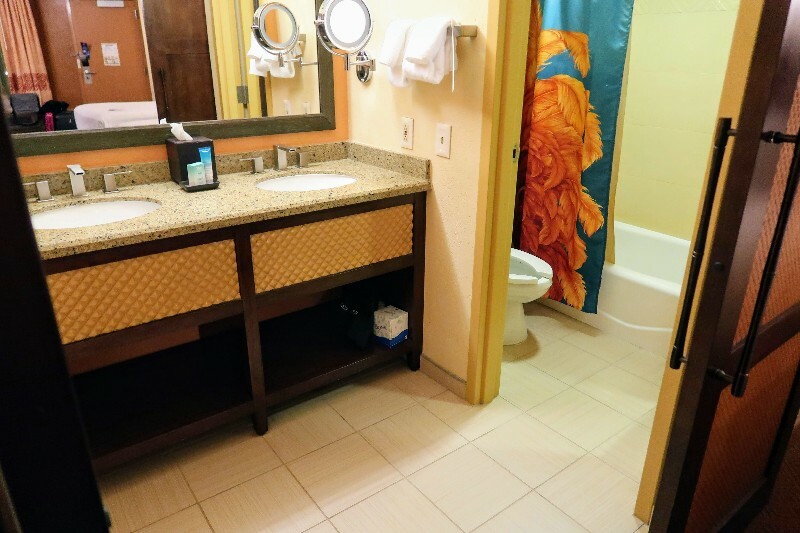 The Caribbean Beach Resort standard view bathroom had two sinks with under sink storage. There is no closet, but near the sinks is a long hanging bar with a shelf above. Next to this closet-like area is the built-in digital wall safe. A full door separates the sink area from the tub/shower and toilet area. I love that the sinks and shower are separate from one another so a couple of people can get ready simultaneously. Our only disappointment is that since it is a full door that opens into the toilet/shower area the shower area seemed very small. 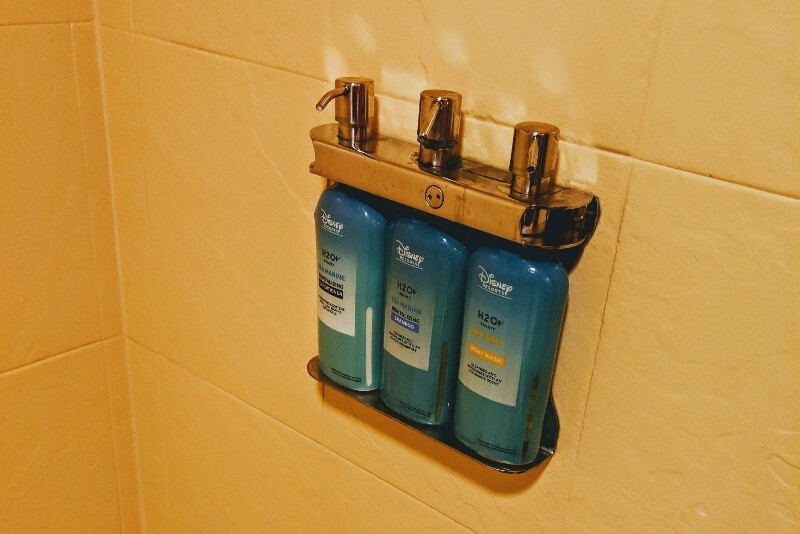 Caribbean Beach Resort has shared toiletries. This means that the shampoo, conditioner, and body wash are large bottles secured inside the shower stall. Mousekeeping refills the products as necessary. Overall we liked our room at Caribbean Beach Resort. However,we didn’t love that the room was carpeted. We have grown to prefer the rooms with laminate flooring like Port Orleans French Quarter, Copper Creek Villas, and Yacht Club. I generally like the set-up of dresser and mini-fridge hidden in the same furniture unit. However, for some reason the dresser drawers in our Caribbean Beach Resort standard view room seemed small. My large packing cubes could not fit flat inside any of the drawers unlike in other Disney resorts we’ve stayed. We also dislike that the rooms and window of our Caribbean Beach Resort standard view room face out to a walkway. This isn’t unique to Caribbean Beach, but more of the expected resort style for moderate or value resorts at Disney (except our Art of Animation Family Suite). Caribbean Beach Resort has complimentary WiFi for hotel guests. The signal is usually good enough for basic mobile device uses, but sometimes streaming video did not work. Guests of Caribbean Beach Resort are charged a fee of $19 per night for self-parking. 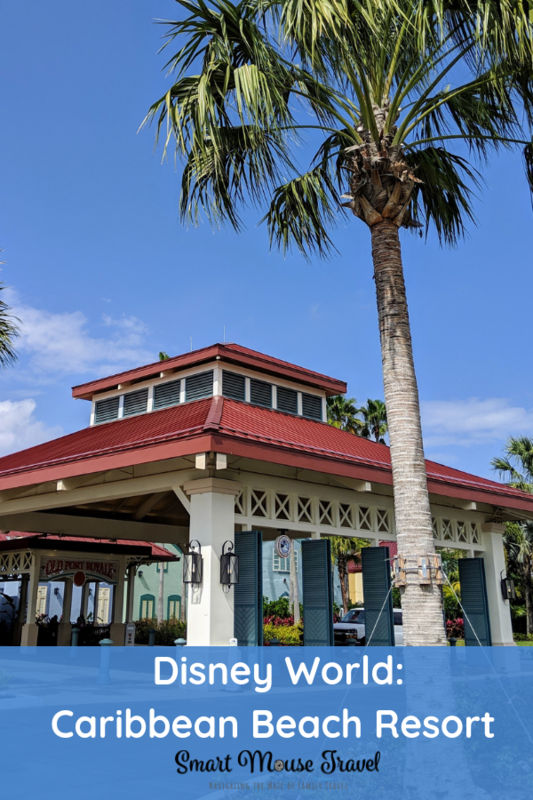 Getting to Magic Kingdom, Animal Kingdom, Hollywood Studios, Epcot, Disney Springs, and Disney Water parks from Caribbean Beach Resort is currently via the Disney World bus system. 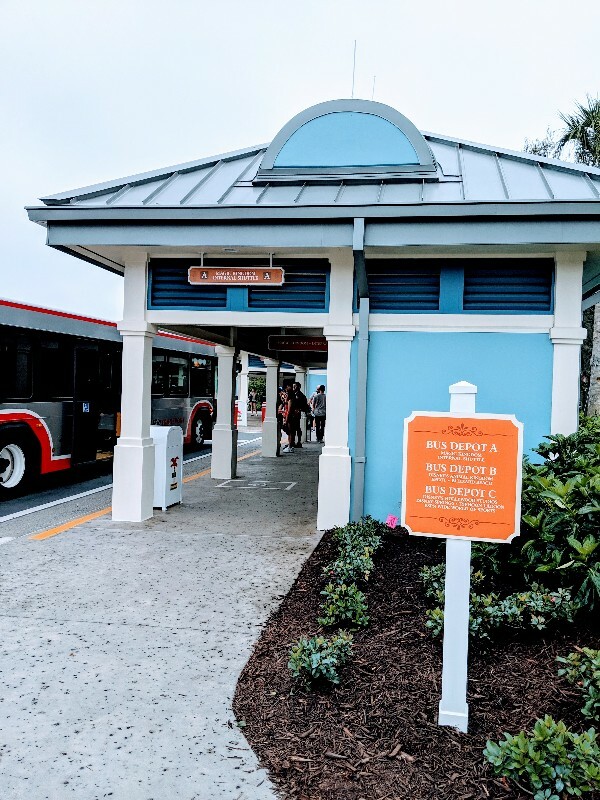 There are several bus stops at Caribbean Beach Resort so although the resort is large you never have walk more than a couple of minutes to reach a bus stop. Learn all about Disney World’s vast transportation system in our complete guide. In Fall 2019, the Disney Skyliner will open. The Skyliner is a new transportation system that will link Disney’s Caribbean Beach Resort to Epcot, Hollywood Studios, and 3 Disney World Resorts: Riviera, Art of Animation, and Pop Century. 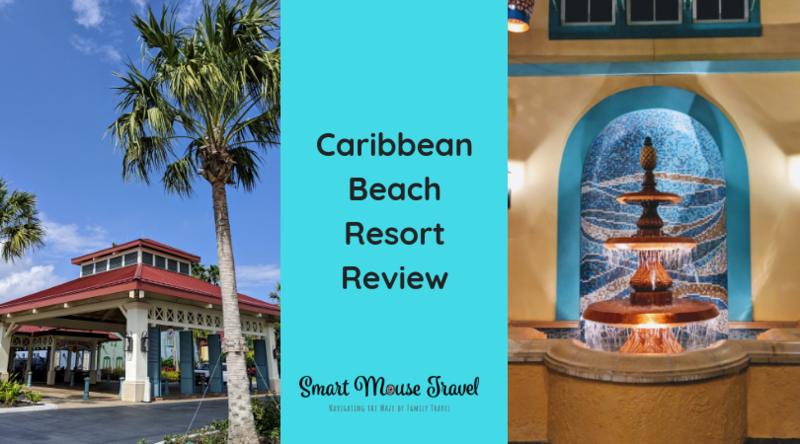 Disney’s Caribbean Beach Resort is a beautiful place to stay with lush vegetation, hammocks along the beach, a playground for little ones, and tons of pool options. 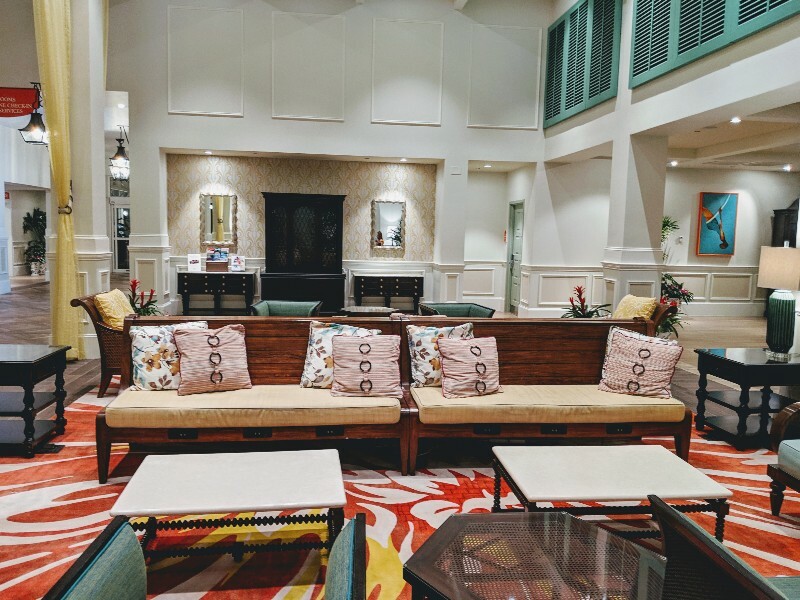 The resort lobby is bright and cheerful with plenty of places to sit while you are waiting for your room or before heading back to the airport. The Caribbean and Latin inspired food choices are a fun departure from the usual hotel fare. In particular, Sebastian’s Bistro was surprisingly good. 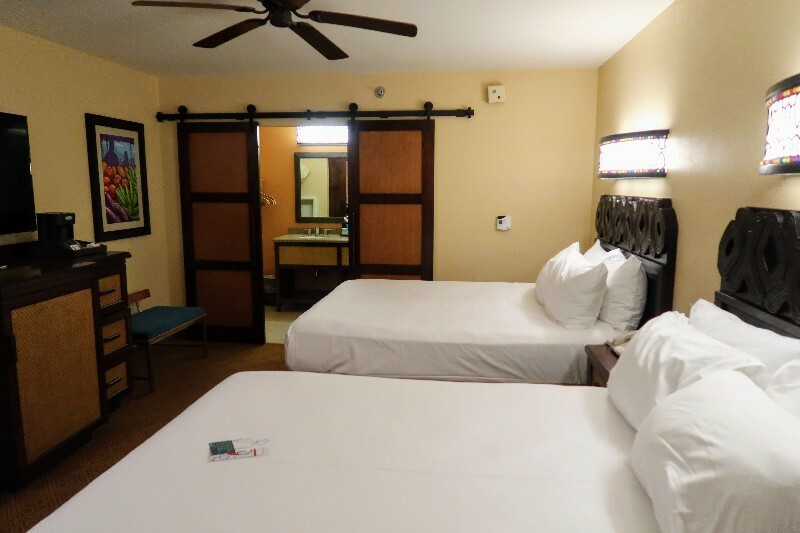 Our stay in a Disney’s Caribbean Beach Resort standard view room was perfect for our family. We loved having sliding wood doors to close off the bedroom from the bathroom area. This made it easy for me to get up and ready without waking anyone else. Having the sinks and shower area separate also made getting ready easier for our family. The mini-fridge and table with chairs made having a quick breakfast in our room easy. Eating breakfast in the room saves us a lot of time and money on our Disney trips. I liked the mix of dark wood, light rattan, crisp white bed linens, and pops of color in the room. These design aspects made our standard view room feel very welcoming. 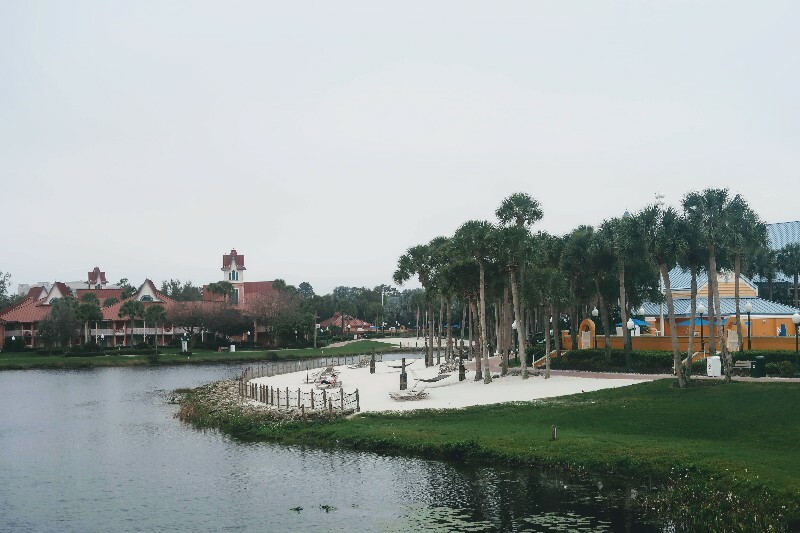 Overall, we enjoyed our Disney’s Caribbean Beach Resort standard view room and would consider staying here again. Find more Disney World Planning resources here! I will be traveling with a large group from Disney’s Carribean Resort to Universal Studios. Is there an easy way to travel there or do I need to rent a large charter bus 50? Going to Universal Studios from Caribbean Beach Resort will require securing private transportation. I hope your large group has a great visit to both Disney World and Universal Orlando!